High friction materials can prevent sliding under high loads or steep inclines. 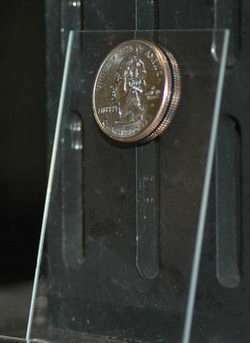 The researchers found that the synthetic array of polypropylene fibers could hold a quarter to a glass slide inclined at an 80 degree angle, yet is not "sticky" like adhesive tape. The fibers, packed 42 million per square centimeter, each measured a mere 20 microns long and 0.6 microns in diameter, or about 100 times thinner than a human hair. "We think the result represents an important milestone in our ongoing research project to understand gecko adhesion," said Ronald Fearing, UC Berkeley professor of electrical engineering and computer sciences and principal investigator of the project. The researchers attribute the low adhesion to the fibers' tendency to straighten out and stiffen up – thus breaking contact – when they are pulled away from the surface. "Ultimately, what we'd like to have is something with high friction but can, with certain motions, also achieve adhesion," said Carmel Majidi, UC Berkeley graduate student in electrical engineering and computer sciences and lead author of the micro-fiber array paper. "With rubber, you control friction and adhesive properties by changing its chemical formulations," said Fearing. "For the micro-fiber array, we just change its geometry and mechanical properties. Thicker, fatter fibers, for instance, reduce the amount of friction created." Moreover, high-friction rubber tends to become "sticky," said Fearing. "The polypropylene micro-fibers are a new class of material that shows some of the advantages of rubber without the stickiness." Fearing was among a team of researchers that, six years ago, described the force that most likely enables geckos to scale walls and ceilings. It had been known that geckos' five-toed feet are each covered with millions of tiny hairs called setae, and like split ends, each seta branches out into billions of nanoscale spatulae. Even more impressive is the gecko's ability to attach and detach from the surface as many as 15 times per second. "A gecko can control its adhesion, sticking really well or detaching readily, and it's still unclear how it does that," said Majidi. "We've taken a very stiff material that has no friction on its own, and by modifying the geometry alone, without altering any of its chemical properties, we were able to achieve this very high friction," said Majidi. The more fibers that are in contact with the surface, the greater the friction generated. The researchers estimate that each fiber produces 200 nanonewtons of shear resistance. 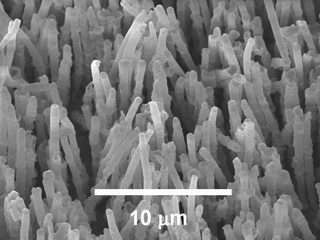 A mere 39 nanonewtons is all that is needed to bend one of the polypropylene fibers. (A nanonewton is a force 1 billion times smaller than the force of Earth's gravity exerted on an apple.) A stroke on a computer keyboard, in comparison, typically requires 700 million nanonewtons.